The Primogenitur Palace was built by Prince Archbishop Paris Lodron in 1631 to accommodate his family. You find it in the Dreifaltigkeitsgasse 15 to 19, by the Trinity Church and near the Tanzmeisterhaus. 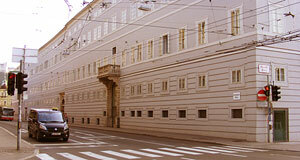 The palace was built in Baroque style and bears the coat of arms of the Lodron family above its main gate. Wolfgang Amadeus Mozart often visited some of his benefactors and friends, the family of the Count Lodron. Mozart dedicated several pieces of music to his wife Antonia and their two daughters. In the 18th century the Primogenitur Palace was seriously damaged. With the exception of the façade, the building was destructed in 1972 and re-built in the following years. To erect a new building, most of the neighbouring Karl-Borromäus-Church was destructed in 1979. The remains of the Primogenitur Palace itself are now used by the Mozarteum, Salzburg′s fine arts University. Since there were suspicions of an asbestos contamination, the building underwent an extensive re-development a few years ago and is now a shiny, new thing to compensate for the sin of demolition that ocurred on this site some 30 years ago.